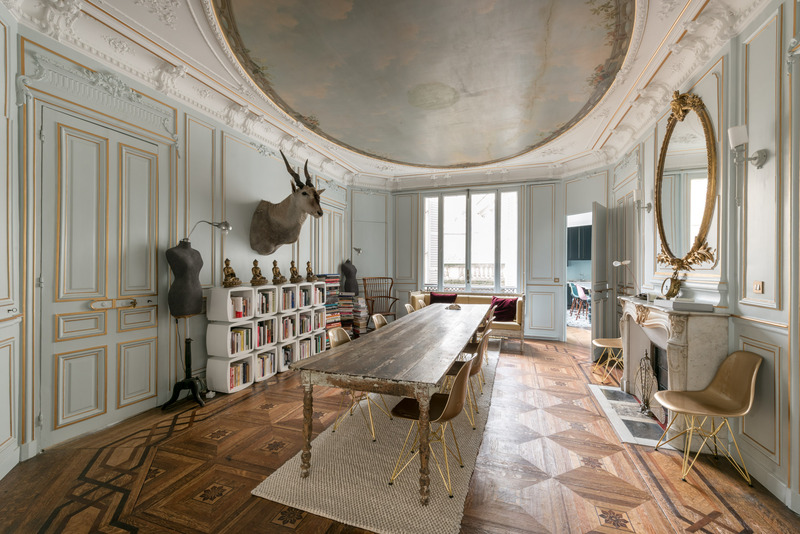 “This street always made us dream,” enthuse the owners of this Paris home. And no wonder – this very calm, yet very central neighbourhood is uniquely inspiring, made up almost entirely of hotêls particuliers, those graceful townhouses that are so quintessentially Parisian. Uniquely inspiring, but not newly inspiring. The famous composers Chopin and Wagner, as well as the novelist George Sand, all once called this distinguished little corner of the city home. 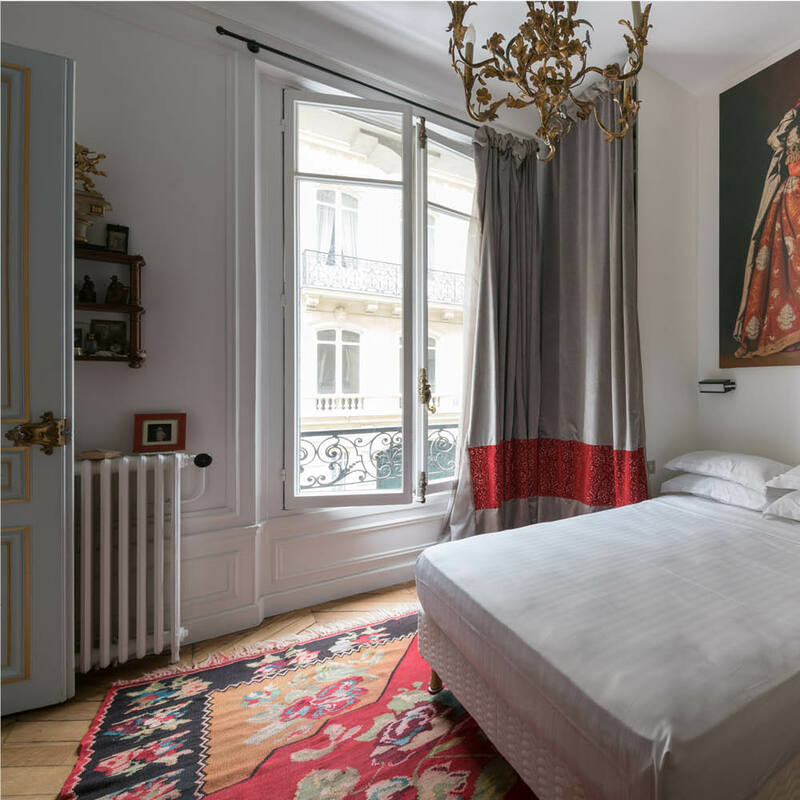 As the frontispiece informs any passer-by, the building that houses this apartment dates right back to 1864 when it was home of the then-director of the Opéra Comique of Paris. He had a whole floor solely for entertaining high society – and these are the rooms that now make up this home. Spaces designed to impress, these were the finest in the house. The mouldings and frescoes have been exquisitely preserved – full of references to music (a cleft note, a violin) they were fashioned to reflect the original owner’s greatest love. They still do. It’s easy to see why this historied home’s newest owners felt at first as though they were “strolling around the Chateau de Versailles.” From its floors (glossy wood, with marquetry work) to its ceilings (two of which, in the sitting and dining rooms, are painted to suggest the sky), this is a decadent and dramatic space. It’s beautiful, yes, and a little imposing. So how to live in such a home? Boldly. The family have a rule that no two pieces (with the exception of their dining chairs) can be the same. “Nothing,” they say, “is conventional here.” Case in point: overlooking the sitting room, a magisterial albino peacock fans its tail behind a turquoise chaise longue (the footstool has been adapted into a coffee table) that they bought before they were even sure that the apartment was theirs. Cabinet curiosities from all eras somehow feel perfectly part of the whole. 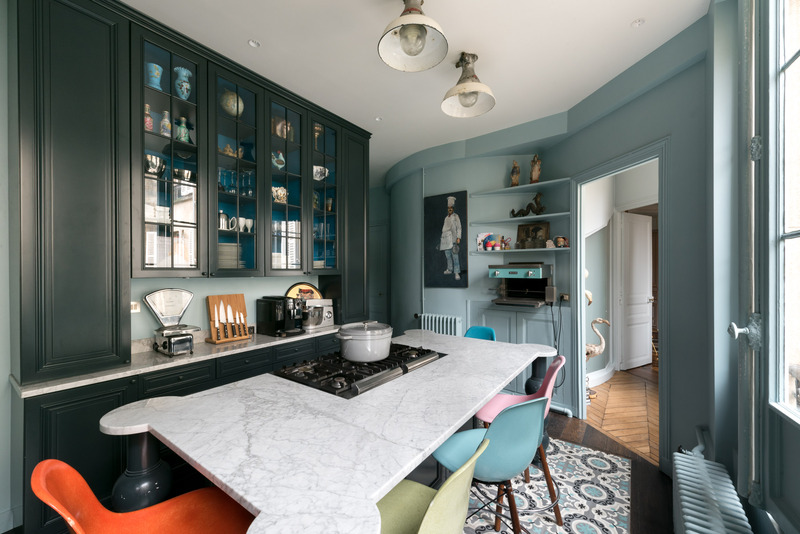 That joyful, oh-so-slightly theatrical air – nicely in keeping with the home’s past – can be felt even in rooms that have been completely redone (space has been reallocated to create the contemporary kitchen and bathrooms). A toilet room has thespian-themed wallpaper, while the otherwise lavish master ensuite has cute ‘Monsieur’ and ‘Madame’ tiles. 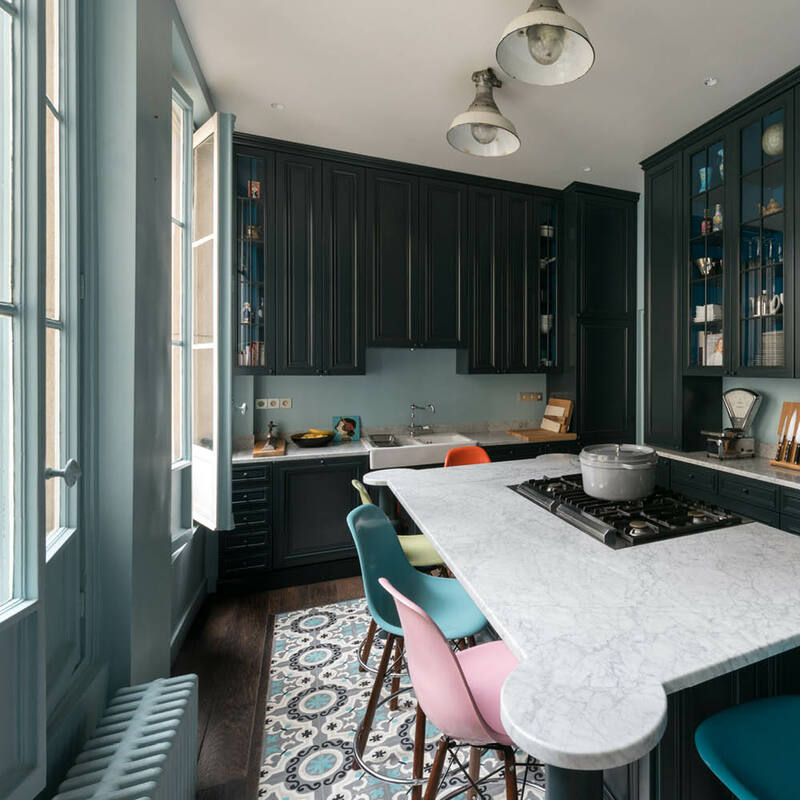 In the kitchen –elegantly decorated in deep greys and sea blues – there’s a marble island set with contemporary chairs, all in different ice-cream colours. The kitchen is the family’s favourite space – and the room of which they’re the most proud. A freshly created space, it shows how they’ve managed to mould this home, and make it a place to be lived in, not merely admired. 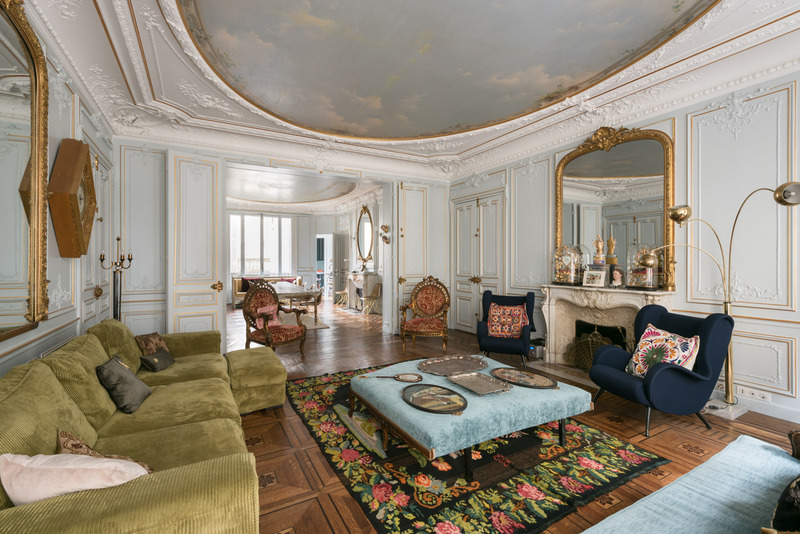 It has a little of the grandeur of the old (high ceilings, traditional French floor tiles), and much of the exuberance of the new. Entirely bespoke, the kitchen’s practical as well as aesthetically pleasing – it has four separate ovens – and it was designed with the family’s love of cooking and entertaining in mind. Envisioned as the ideal place to relax with family and friends, that’s exactly what it feels like. Elsewhere, too, the newest owners’ real loves glint just as brightly as the original designer’s. In the master bedroom, the eye is immediately drawn to a skilful replica of an artwork by Zurbarán, which they had commissioned. Illuminated by a delicately wrought chandelier, it brings character to a room that’s otherwise subtly done – a restful place away from the dazzling atmosphere of the sitting and dining rooms. Step outside, and you’ll find that that dreamy location is almost as peaceful. 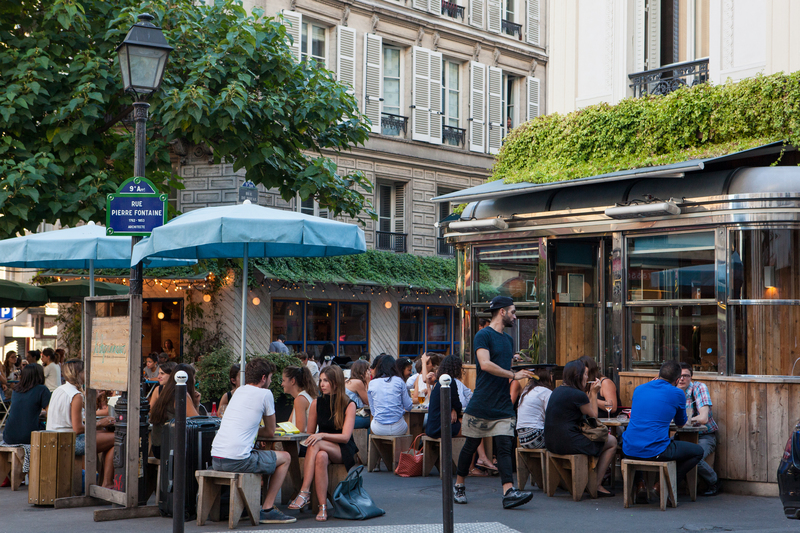 Here, you’re as secluded as it’s possible to be in the centre of Paris. This exclusive quarter is a place where the crowds thin out and the noise lulls. A place that still brims with authenticity. An old-style patisserie will be easy to find, as will a good, traditional French grocery. The boutiques, too, are genuinely independent and typically Parisian – places where you can pick up an artisan-made piece and know it’s one of a kind. And yet, for all its old-time elegance and traditionality, this isn’t a shut-away neighbourhood, genteel and stuffy. Walking its streets, you might easily come across a newly opened restaurant, or a hip little bar. The family love the closeness of the metro, which makes neighbouring Montmartre (a lively, arty district) and the Grands Magasins (pure Parisian chic) feel right nearby, and brings the rest of the city within easy reach too. That, perhaps, is why this historic home feels so fresh and current – it may look polished, but it’s still, even if only in a very small way, an ongoing project. For the family, that’s a good thing – they say that to finish a project entirely is to want to begin a new one. So at almost a century and a half old, this home’s still a place full of life.